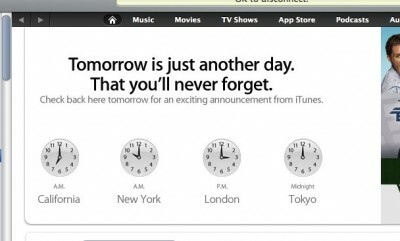 Does this have something to do with that button that was added to the iTunes player this weekend? It doesn’t seem to do anything, and it’s not in the help. Everything jells iTunes Cloud, except: how will the 3G networks cope with the traffic when they can’t keep up with the traffic already? Also maybe there is some “music amnesty”, were you’ll be allowed to “upload” your library – no questions asked. Only non-commercial music will be uploaded, the rest will only tagged as yours. Local TV contracts are way to complicated to announce worldwide. But what if Apple will become a TV network themselves? Buying the worldwide rights to the best TV productions available. Feeding the kitten-heart eating bosses with more money they can think of!? When all the talk about bringing the internet to your TV set, I wonder what needs to be done to bring the TV to your computer/device. And than being able to watch “TV” on your iDevice or TV set (via ATV or hooked up Mac) with EPG, PVR, or maybe without a TV schedule at all. Or a schedule based on actors, directors, category. This “Cloud” idea is weird. What would happen to the iPods? NOTE… the “Tomorrow is just another day.” announcement appears in the iTunes store on iPads also. Beatles in the iTunes store? The fabled yellow iPod? New to the iPod, iPhone and iPad. Adobe Flash! It’s the Beatles. “Just Another Day”? C’mon. White ad? It couldn’t be more obvious.